Never Give Up: Why Does Freedom Matter? 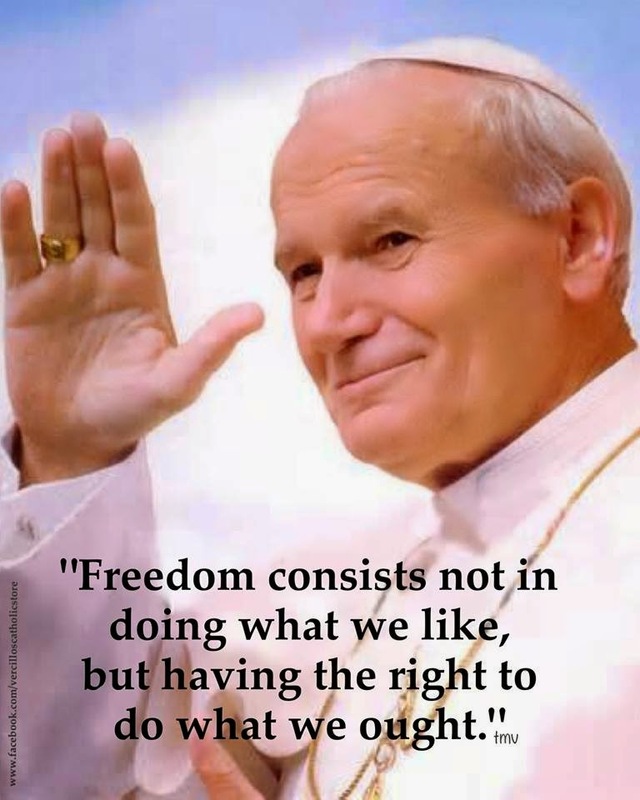 St. John Paul II on freedom. What does he mean? How do we understand freedom? On this Independence Day weekend it is worth asking ourselves, "Why do we care about freedom, anyway?" And after we have gone through all the standard replies learned over the years, do we really know what freedom means? Do I know why my freedom is important for me? Do I know how to live freely? What does freedom mean, for me, for human beings, for society? It doesn't mean "the absence of all restraints" or merely spontaneous activity without guidance about the reason why human beings act. A chaotic "freedom" in society -- a disoriented space for the expression of impulses, urges, appetites, and desires -- does not lead to a utopia of independent self-realization. Rather, it inevitably results in the emergence of an oppressive social system in which the strongest and most powerful people impose their desires on everyone else. Fundamentally we need to be free because, as human beings we know that we are made to live for something, to pursue, obtain, embrace, and be embraced by the mysterious reality that calls out and awakens our freedom in the first place. This embrace is what freedom seeks in order to realize itself. This is what freedom "wants" to do from the moment it springs up from the profundity of the human heart, and therefore this is what freedom "ought" to do. The word "ought" is not opposed to freedom. It does not imply the dehumanizing imposition "from the outside" of alien rules that reduce and manipulate the person. It expresses, rather, the exigencies of freedom itself. Karol Wojtyla (St. John Paul II) was a man who knew what it was like to be deprived of freedom. He knew what it was like to be prohibited by human powers from doing what free people ought to do, which is to try to know and love things as they really are, to search for the meaning of life, to help one another, to cherish the dignity of every human person, to walk toward one's destiny, to love one another. Freedom is for love. And this love does not rest, does not become fully free, until it gives itself to the Infinite One who alone is worthy of it, who draws it continually, beyond all things, toward the infinite life that has been promised to every human heart. We have been created for Infinite Love. This is why freedom matters.